Annan Athletic are delighted to announce the signing of striker Ross Fergusson with a one year deal at Galabank. Ross is familiar with Galabank having spent a short spell with Annan last season. Fergusson joined us last November on an emergency loan deal and played 6 games during his time here, scoring his first SPFL goal in that time. 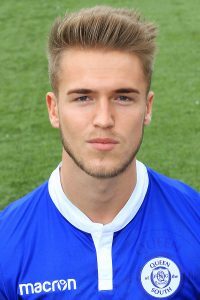 Queens recalled the striker in January but released the 21 year old in the summer. Peter Murphy is delighted to get the striker signed on a permanent deal, having failed to get him on board this time last year. Ross goes straight into the squad to face Livingston in today’s Betfred Cup tie.